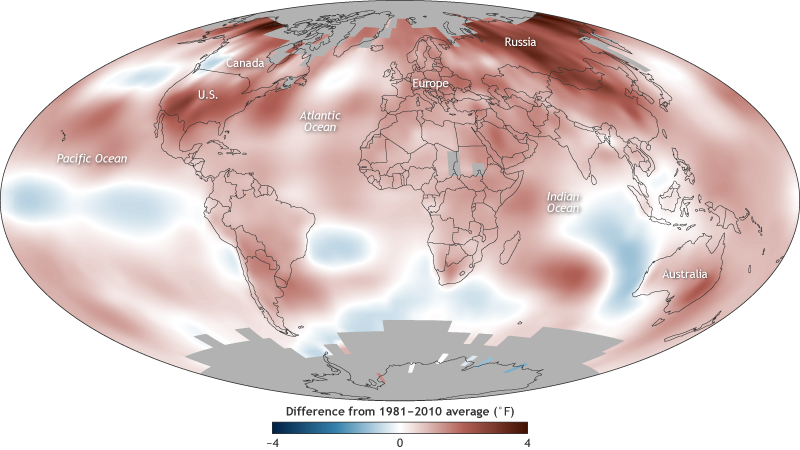 2017 was 0.38­–0.48° Celsius (0.68–0.86° Fahrenheit) above the 1981–2010 average, with especially warm conditions in the high latitudes of North America and Russia. 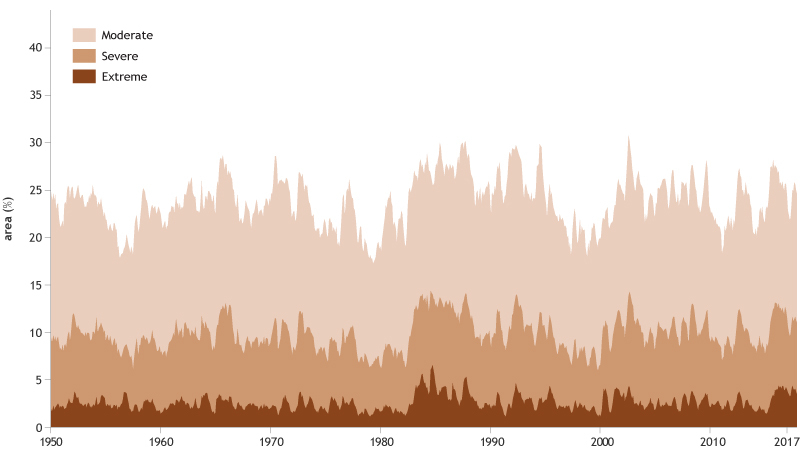 It was the warmest non-El Niño year in the instrumental record. 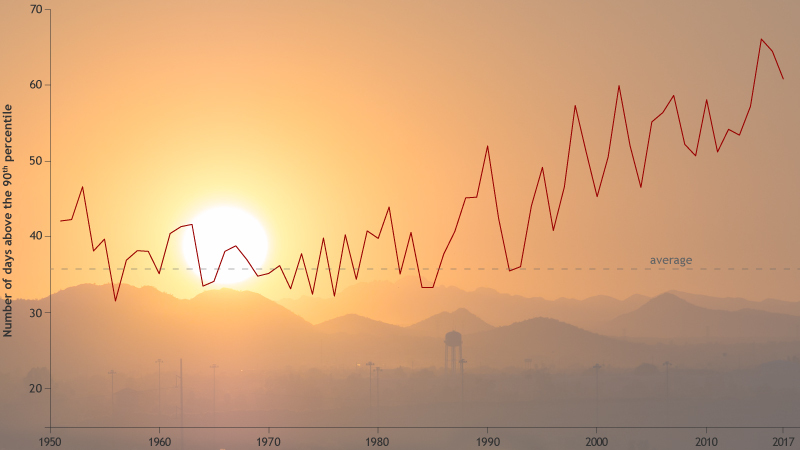 Since 1901, the planet’s surface has warmed by 0.7–0.9° Celsius (1.3–1.6° Fahrenheit) per century, but the rate of warming has nearly doubled since 1975 to 1.5–1.8° Celsius (2.7–3.2° Fahrenheit) per century. 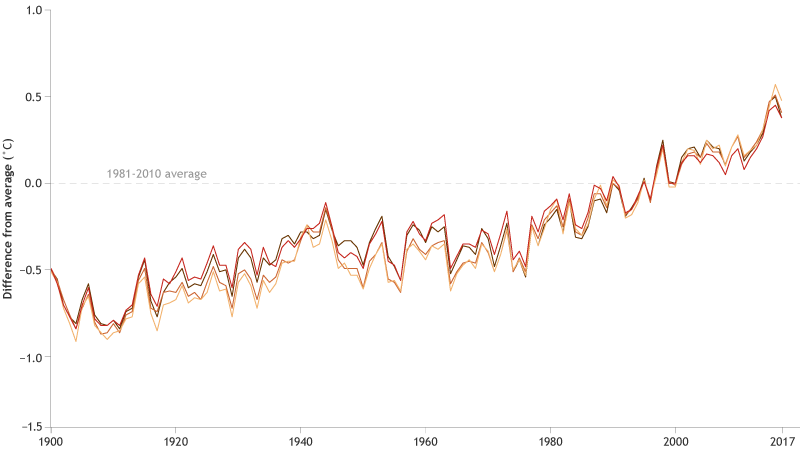 The 10 warmest years on record have all occurred since 1998, and the four warmest years on record have all occurred since 2014. 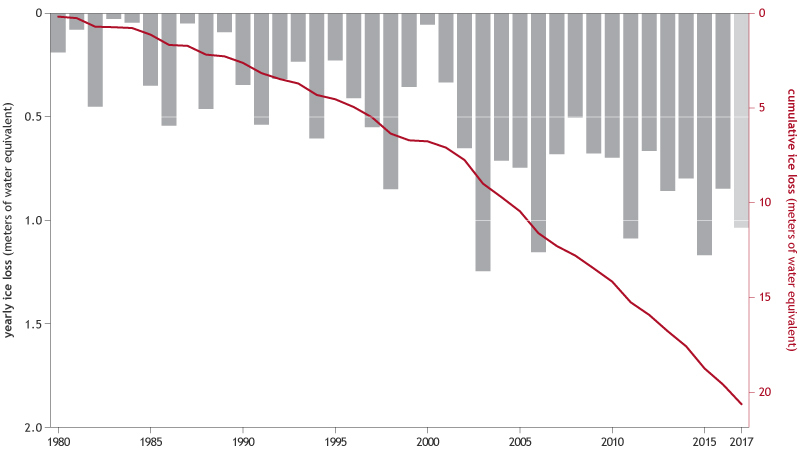 Based on the preliminary data, 2017, is likely to be the 38th year in a row of mass loss of mountain glaciers worldwide. According to the State of the Climate in 2017, “The cumulative mass balance loss from 1980 to 2016 is -19.9 meters, the equivalent of cutting a 22-meter-thick (72-foot-thick) slice off the top of the average glacier." Global mean sea level in 2017 was the highest in the satellite record—77 millimeters (3 inches) higher than it was in 1993. 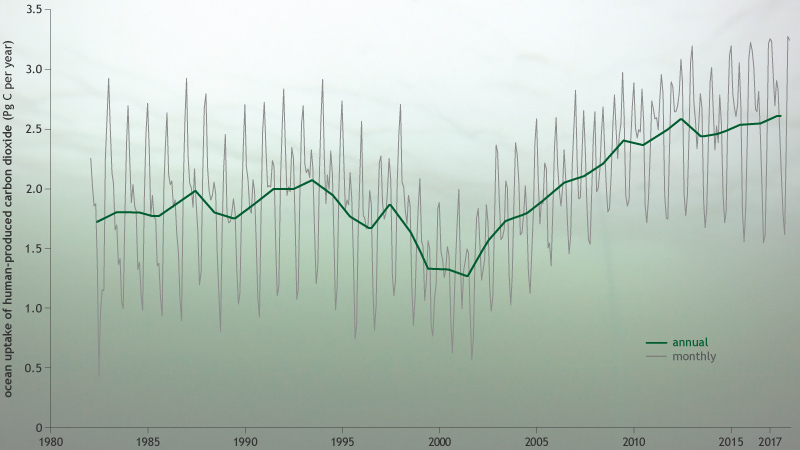 Sea levels were higher than average over most of the globe, in keeping with the long-term upward trend. 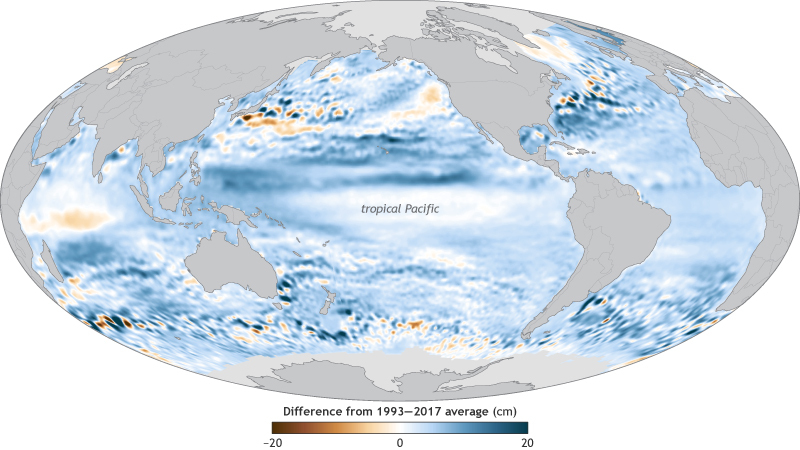 Sea levels were close to their long-term average in the central tropical Pacific, making the area a relative low spot. 2017 set a new record for global sea level. 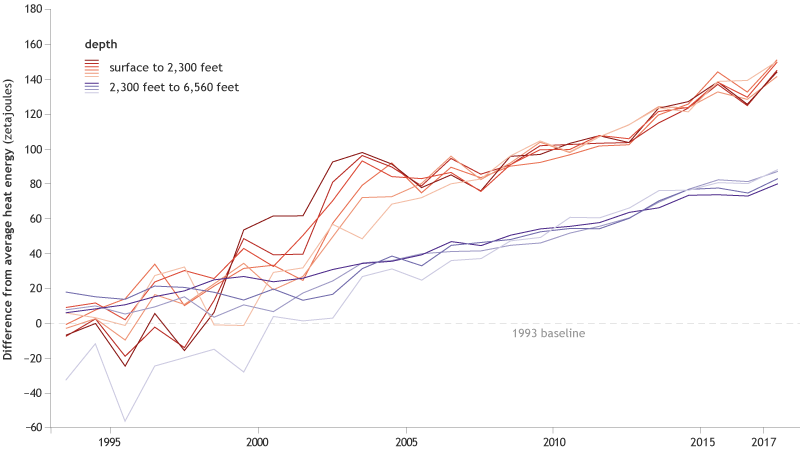 The average rate of sea level rise since 1993 is 3.1 millimeters (0.12 inches) per year, and the increase has been accelerating by 0.084 millimeters (three thousands of an inch) per year each year. Sea level rise is increasing the severity and frequency of coastal flooding in many parts of the world. More than 90 percent of the excess heat absorbed by the climate system due to human-caused greenhouse gas warming is stored in the ocean. Human-produced greenhouse gases are slowing the rate at which heat escapes into space. Between 1993 and 2017, the global ocean has gained 0.36–0.40 watts of heat energy per square meter near the surface (0–700 meters) and 0.19–0.35 watts per square meter at deeper levels (700–2,000 meters). In 2017, the ocean absorbed 2.6 petagrams of human-produced carbon, which is 36% higher than the 2005-2015 average. By absorbing human-produced carbon dioxide, the ocean reduces the amount of warming those emissions would otherwise cause, but it increases the water's acidity, which harms ocean life. From 2002 through 2017, the ocean rapidly absorbed carbon dioxide from fossil fuel emissions. 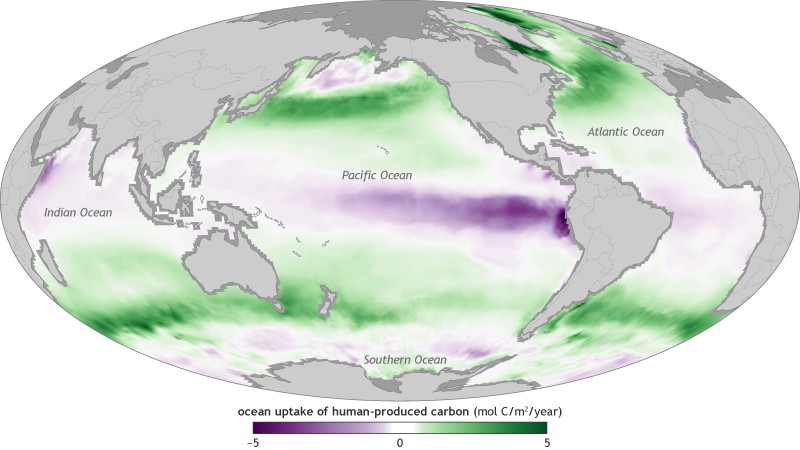 Since 2000, the rate of ocean uptake of human-produced carbon has increased by 0.8 billion tonnes per decade. 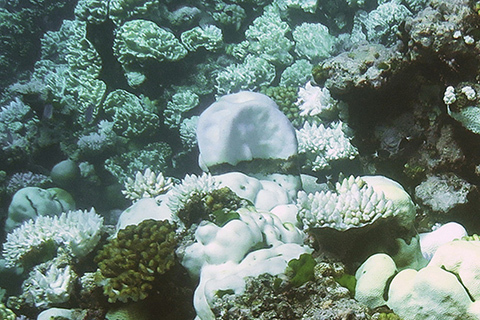 If this trend continues, additional carbon dioxide will be kept out of the atmosphere—slowing atmospheric warming, but accelerating ocean acidification. 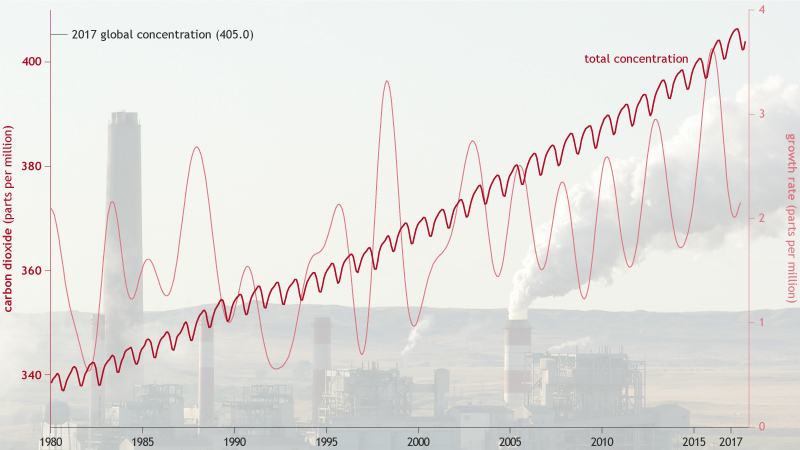 Since the start of the Industrial Revolution, atmospheric carbon dioxide (dark red line) has risen more than 45%, hitting a new record high in 2017 of 405.0 parts per million. 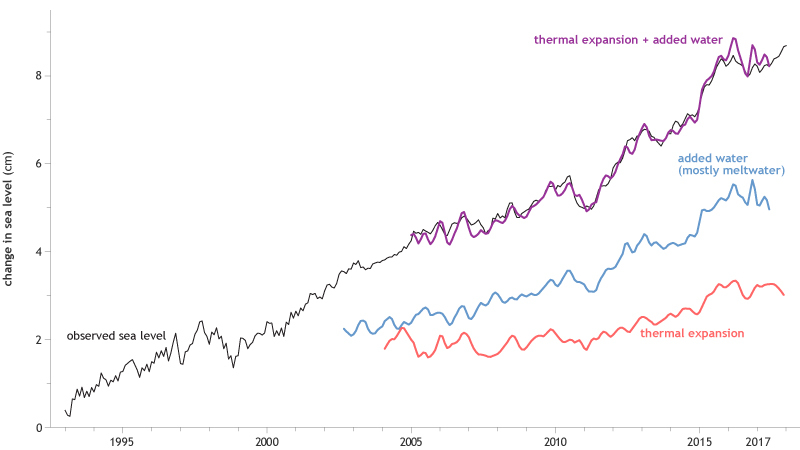 Levels go up and down with the seasons, but the long-term trend is clearly upward. 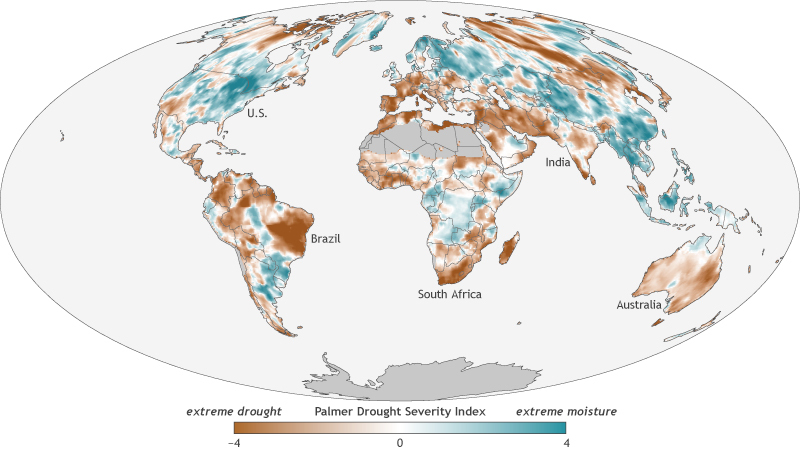 Large areas of severe or extreme drought affected every continent except North America in 2017. Many coastal countries in Africa suffered drought, and an especially severe drought took hold in southwestern India. Globally, drought conditions were less severe in 2017 than 2016, but they were still above average overall. Global-scale drought conditions temporarily improved in early 2017 compared to recent years. 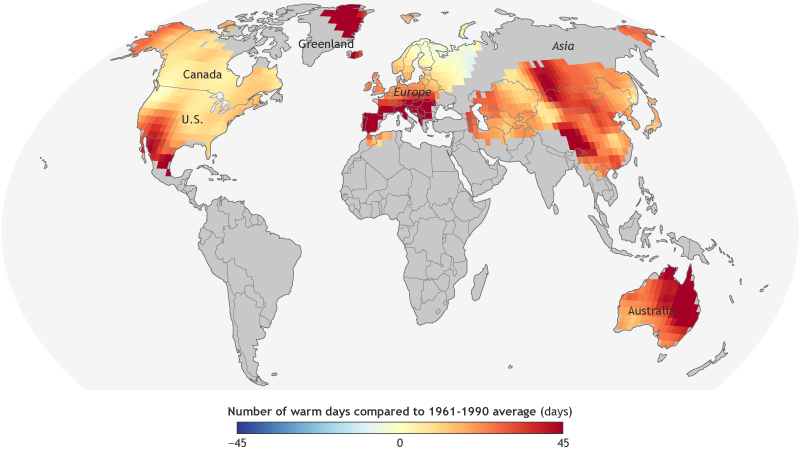 The highest numbers of extremely warm days in 2017 were found across southern Europe, central Asia, and eastern Australia, all of which experienced at least 40 more extremely warm days than their long-term average. Extreme heat relaxed a bit in 2017 compared to 2016 and 2015, the latter of which holds the record for highest number of hot days. Still, 2017 recorded more than 60 days of extreme daytime heat worldwide, nearly double the 1961-1990 average of 36.5, continuing the long-term trend toward more hot days each year across the globe. Each year from January to June, hundreds of scientists from around the world crunch the numbers on the previous year's climate, reviewing and cataloging everything from sea level, to the number and strength of hurricanes in every part of the ocean, to the size of the Arctic sea ice pack. 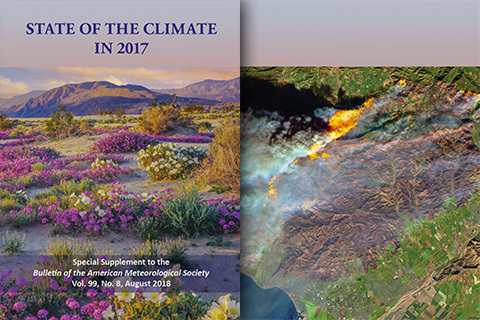 Led by scientists from NOAA’s National Centers for Environmental Information and published by the Bulletin of the American Meteorology Society, this year's report offers insight on global climate indicators, extreme weather events, and other valuable information on the state of the climate. 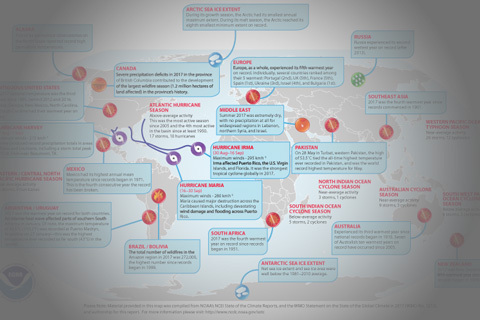 As part of the annual State of the Climate reports, editors and contributors pull together a map of the year's noteworthy extreme events and climate anomalies. This interactive version of the 2017 map provides additional details about the events as well as maps and other data visualizations to put the year's extremes into context. Color-coding of the dots on the map indicates which events were consistent with seasonal patterns that often occur during La Niña, which developed in late 2017 (hint: they almost all had to do with seasonal hurricane activity). 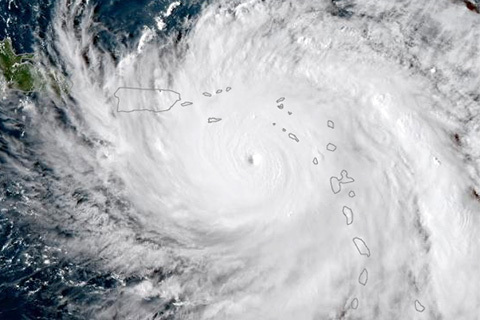 The State of the Climate in 2017 report includes a summary of the devastation in Puerto Rico from Hurricane María, describing damage so widespread and severe that thousands of residents of the Caribbean island moved to the U.S. mainland in the aftermath. As part of the State of the Climate in 2017 report, experts describe a record three-year-long episode of mass coral bleaching at tropical reefs worldwide. 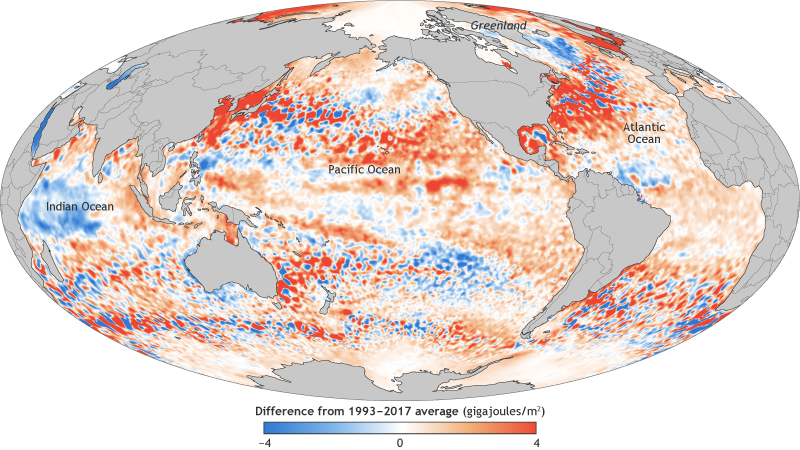 Previous global bleaching events required the presence of El Niño, but the devastating 2014–2017 event began before El Niño emerged and continued long after it ended—implicating human-caused global warming in the mass die offs. 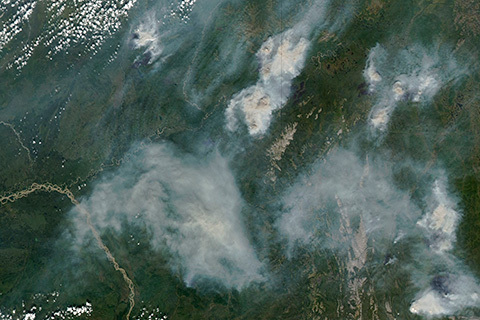 In a sidebar to the State of the Climate in 2017 report, experts describe how human-caused climate change is leading to longer, more damaging fire seasons in the evergreen-dominated boreal forests of Alaska, Canada, and Eurasia.